This recipe certainly does not adhere to a New Year’s resolution diet but it is a family favorite and I made it over the holidays and wanted to post it. This is easy, creamy, delicious and decadent. There are many ways to use this mousse. The below picture shows it piped into chocolate cups (which I bought at Word Market). The original recipe suggests pouring this into a graham cracker crust. I like to chop up mini Snickers bars and fold them into the mousse and make it into a pie or use as a cake filling. I made my friend Gretchen’s wedding cake which was chocolate cake filled with peanut butter snicker mousse. It’s impossible to have just one bite of this fluffy, creamy goodness. Enjoy! 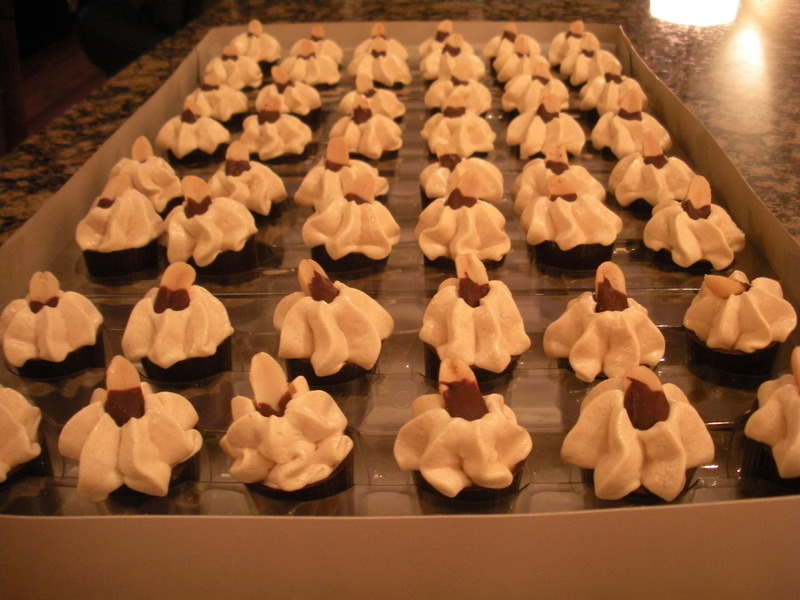 Chocolate dipped peanuts or crushed peanuts for garnish. slowly add the sugar and whip until light and fluffy, scraping the sides of the bowl at least once. This will make enough to fill a 8″ or 9″ graham cracker crust. Yum!!!! I need to get married again so I can eat these scrumptious treats!